I'm new to Android and obviously this LG Nexus 5. 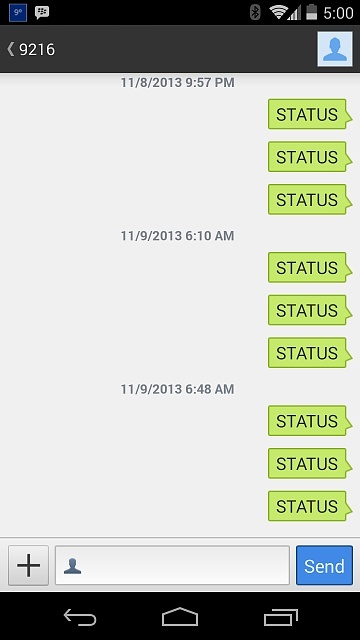 I'm concerned that it is sending these "STATUS" text messages on its own. If these are "Premium" texts, that could add up to significant costs. Any ideas what application or setting to look for ? Thanks. Wow, what the hell is that phone doing?! Alright, let's see if we can figure this out. First, please force stop the message app and clear all of the data. Second, uninstall any fishy apps you might have recently downloaded. Third, run this app. That's all I can think of at the moment without more information. What carrier do you have? I've force stopped Textra and cleared the data - I only installed it today as I wasn't thrilled with Hangouts. Fido is my carrier. It has not sent any sms since early this morning, strange. I will remove most of the apps I installed as they are not critical - the only one I really need is the BBM for work. After that I will run the scan from the program you reccomended. Thank you. How old is your sim card? If it doesn't say LTE on it you may want to get an updated one. It is an LTE sim. I uninstalled every app I added except BBM. I ran the Security scan, no malicious items found. Will see what it does between now and the morning. Thanks. I think there is a problem with Textra. I read a review on the Textra Google Play app page, and someone was saying the same thing. He said that he installed Textra because he didn't want Hangouts handling his texting, and it was working fine but then he tried to send a text to a group of friends and the send failed. After that, his phone started sending garbage texts every hour to this group of friends without his intervention. He tried everything to get the texts to stop, uninstalling and even turning off his phone, but when he turned it back on, there were the texts. Once this reviewer said that he was still experiencing a problem after turning off his phone, I passed it off as someone not knowing what they were talking about. But now after reading this, I'm thinking there is something wrong with Textra that causes automatic texts to go out without user interaction. In my case it was happening in Hangouts first, yesterday I changed to Textra as it seemed to suit my needs better. I also have a nexus 5 sending the same error, i am with Fido as well, i've had the phone since Nov.8 and this is the first time it has shown up (Nov. 11). I think it may be related to the visual voicemail app that fido provides, this is something i installed this afternoon. Do you have this installed? I uninstalled all apps I put on including fido visual voicemail, and it stopped sending these. Now tonight I just put it back on to see if it would work. I'm going to take it back off now though. I've yet to experience this automatic spam texting. I don't have any fido/visual voicemail apps installed, besides Google Voice. I'll keep an eye on it. I have the same issue with the same phone which started right after I installed Visual Voice Mail Plus for Fido as well as YouMail. I contacted Fido and asked them to turn off outgoing SMS until I figured it out. They advised me to contact LG. LG advised me to contact Fido. Kind of frustrating, I couldn't get VVM+ to work, can't get normal voicemail notifications. Hoping for a fix soon. Everyone was talking up Textra that is a lot better than Hangout but after using Textra for a day I went back to 8SMS. If you have the Fido Visual Voicemail app I would uninstall it till there is a fix. Last night I phoned Fido again. Told them I could not get Visual Voicemail Plus app working on my Fido HTC One S or my Google Nexus 5. VMM+ app would generate two warnings on launch - not subscribed and problem with service, it would also send SMS to 9216. I explained VMM worked perfectly on my BlackBerry Z10. He verified the VVM was active on my account, then he wiped out the vmm settings on my account, reset them while I rebooted my HTC One S, I received an SMS indicating VMM was ready to be setup, followed the link to downloaded the app, opened it (because it was already installed), prompted through the setup, then the app ran without any more warnings. Tested, it was working. Then I moved the SIM to my Nexus 5, launched Fido VMM+ app, original two warnings showed, then went away. I checked SMS - a couple STATUS SMS were sent to 9216, then one said Activate:dt=8, then two more STATUS SMS and that was it, no more STATUS texts have been sent. Phone will now display missed call, voice message icon (may be VMM+ icon not Nexus 5 icon ? ), there is also a notification for VVM+. When I open the VVM+ app it shows any messages that were left, I can read them and play them. I have a nexus 4 and my phone has been doing this as well since downloading Kitkat. I have Fido as well, but as someone who works for customer service at a phone company I know that there's nothing Fido can do to stop this. I did delete VVM off of my phone, after reading the forum but my VVM app doesn't work now after upgrading my value pack to the new voicemail to text option anyway. I have only received one voicemail since getting Kitkat though, and I believe I deleted it so there is something seriously wrong if this is voicemail related. The last time it did it, it sent "STATUS" about 11 times. Just trying to help. Hope you guys resolve this. I'm also with fido, have the voicemail app installed and kitkat. I think it only started happening after kitkat. Samsung Galaxy S4 - Where is Kies in Connections?